Every year 3,328 people are killed in car accidents – and distracted drivers cause 421,000 of those accidents. Yet, no matter what we do – the persistent problem of distracted driving continues to claim lives. In fact, a recent study released by the National Safety Council found that more than 37% of all car crashes were caused by cellphone use. 16% of those accidents were caused by texting alone. Talking on the phone while driving made drivers more than 4x more likely to be involved in a car accident. And texting while driving increased the odds of being in an accident by 23x! Just how prevalent is cellphone use while driving? The CDC found that 69% of all drivers between 18 and 64 talked on their phones while driving and 31% texted while driving in the last 30 days. Yet, distracted driving isn’t just caused by cellphone use. Anytime you take your eyes off the road, your hands off the wheel, or allow your thoughts to focus on something else besides driving, you are guilty of distracted driving. Cell phone use is such a bad form of distracted driving because it combines all three types of distractions. 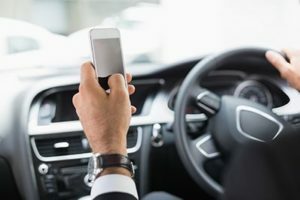 In order to use your cell phone, you must take your eyes off of the road to dial, your hands off the wheel to hold the phone, and your brain off of the task of driving the entire time. This year, make a pledge to keep your eyes on the road, by putting your phone away. Consider placing your phone in airplane mode to avoid getting distracting texts, email alerts, and notifications. If having your cellphone nearby is too tempting, put it in the glove box or in the backseat. There are also numerous apps available for both iPhones and Android phones that will help you avoid texting while driving. If you have been involved in a car accident, it is important to understand your legal rights. You have a right to seek compensation from the at-fault driver – and recover money to pay for injuries, lost wages, pain and suffering, and car damage. Contact the experienced Colorado Springs car accident attorneys at the Green Law Firm today to schedule a no-obligation consultation and discuss your case. Call us today at 1-719-694-8515.